Not to be confused with gravity. 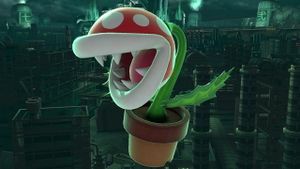 Piranha Plant falling in Ultimate. Falling speed is the rate at which a character can move downward in mid-air. A character's falling speed can greatly impact the fighting style - for instance, Fox, a fast-faller, uses his aerial speed to perform SHFFL'd attacks very quickly, whereas Jigglypuff, a floaty character, uses its low falling speed to attack multiple times in mid-air. While falling speed's main effect is determining how quickly a character can drop downwards, it also affects the physics of knockback. After a character is launched, their gravity still applies, slowing their vertical ascent until the reduction equals their falling speed; as a result, characters with higher falling speed have their vertical knockback reduced for longer, improving their vertical endurance while also hampering their ability to recover from horizontal blows. However, weight is still the main factor in how much knockback is sustained in the first place, and the two factors are independent - a fast-falling character is not necessarily heavy, and vice versa. Samus and Fox are notable examples of this. The items Bunny Hood and Metal Box increase the user's falling speed. Some stages can also affect a character's falling speed, such as the flying-type portion of Pokémon Stadium 2 and the falling portion of Summit. In Super Smash Bros. 4, the equipment bonus effects, Thistle Jump and Anchor Jump, can be used to alter a character's falling speed, with Thistle Jump decreasing it, while Anchor Jump increases it. However, both bonus effects also alter a character's gravity. All characters can also fast fall at any time to increase falling speed. Characters are generally put into one of two groups of falling speed: floaty and fast-faller, each of which have certain advantages and disadvantages depending on playstyle. Fast-faller is a name that refers to characters with a fast falling speed. Fox and Captain Falcon are prominent examples of characters with very high falling speeds in the Super Smash Bros. series, with Fox being unusually light for his falling speed. Fast-fallers enjoy increased speed in the air and faster SHFFL'd approaches; however, they suffer from shorter recoveries. They are also susceptible to different combos from floaty characters. For instance, Captain Falcon can chain grab floaty characters with his down throw, but cannot do so against fast-fallers. On the other hand, he can tech-chase fast-fallers (or chain grab them given the right percents) with up throw, which he cannot do against floaty characters. Generally, fast fallers are more vulnerable to chain grabs and combos (although weight and character size are other factors as well); for instance, in Melee, Marth can chain his up throw on the space animals repeatedly and ultimately finish them off with a forward smash, but this combo is substantially less effective on a floaty character such as Peach or Jigglypuff (although, notably, this chaingrab does not work on fast-faller Captain Falcon, as he is too heavy). Floaty is a name that describes characters with a slow falling speed. Jigglypuff and Samus are prominent examples of very floaty characters in the Super Smash Bros. series; Samus being floaty, however, is unusual for a heavyweight. Floaty characters have great benefits in terms of performing aerial attacks, since one would able to perform multiple aerial attacks in succession (such as Jigglypuff's slow falling speed and multiple mid-air jumps allowing it to do the wall of pain) and easier recoveries due to slow falling speeds allowing easier maneuvering. Downsides include vulnerability to being juggled, having easily predictable recoveries, or being KO'd vertically easily. On the flip side, floaty characters tend to be less vulnerable to chain grabs and combos. Fighting Wire Frames have falling speeds of 2 (Male) and 1.8 (Female). Sandbag has a falling speed of 1.6. The Alloys are equipped to have falling speeds of 1.28 (The same as Mario, just like they share his weight, air speed and gravity), even though they are modeled after characters of differing air status (falling, air movement, gravity). Excluding Giga Bowser and Wario-Man, no character in Brawl can surpass a falling speed of 2 without fast falling; King Dedede comes closest, falling nearly as fast as Ganondorf in Melee. This page was last edited on April 18, 2019, at 13:45.